In recent years climate change has become recognised as the foremost environmental problem of the twenty-first century. Not only will climate change potentially affect the multibillion dollar energy strategies of countries worldwide, but it also could seriously affect many species, including our own. 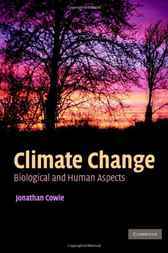 A fascinating introduction to the subject, this textbook provides a broad review of past, present and likely future climate change from the viewpoints of biology, ecology and human ecology. It will be of interest to a wide range of people, from students in the life sciences who need a brief overview of the basics of climate science, to atmospheric science, geography, and environmental science students who need to understand the biological and human ecological implications of climate change. It will also be a valuable reference for those involved in environmental monitoring, conservation, policy-making and policy lobbying.